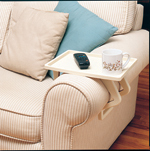 This walker tray can be attached easily onto folding and nonfolding walkers with sidebars and an 18 in horizontal front bar. The walker tray clips to side bar when not in use. Top rack dishwasher safe. This walker accessory measures 12 ¾ in deep, 21 in wide at the base and 15 ½ in wide at the top. The plastic tray weighs 28 oz. Placemat color may vary. Replacement placemats are available separately.